Sculpture Kills is a in-progress writing project and performative lecture that surveys fatal works of contemporary art— sculptures that slay and performances that murder. With examples such as Christo, Serra, Pippa Bacca, Luis Jimènez and others, Sculpture Kills delves into the political and critical implications of deadly artworks. These accounts set a precedent to discuss power balances in the art world and when monuments lead to violence in the public sphere. Sculpture Kills is a reexamination of the barrier between life, death and art. The balance of conductive materials in “Revolution” creates a sense of volatile tension, of perpetual suspension in the harmonious moment before an explosion. 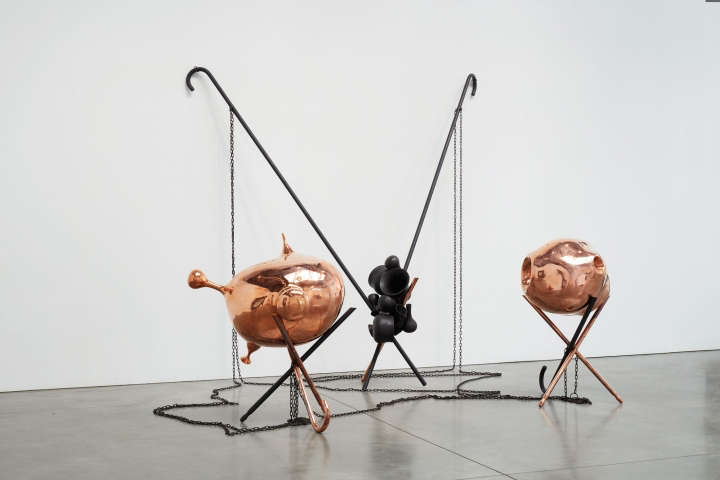 Tunga’s sculpture suggests that a successful revolution requires a collective pause. we ought to remember that in America, both cowboys and clowns have a history of murder. Violent crime and pop culture are what blacklight reveals in our psyche. Where one ends and the other begins in the Trump administration is what Judith Bernstein’s rage and humor thrusts into view. An abundance of flowery work could point to a more conservative time, left and right alike. The violence of flowers – that which is shown is that which is palatable and that which is missing is that which has been censored. 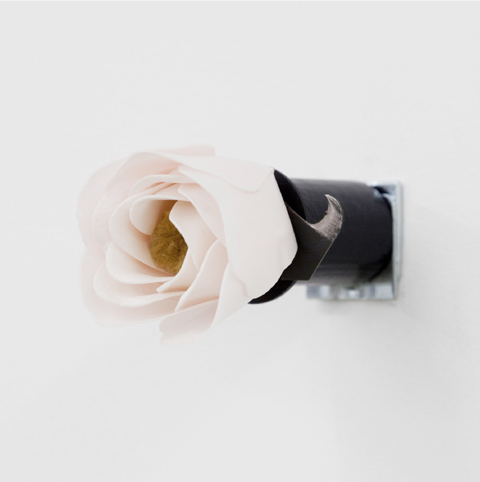 In the Disagreeable Rose by Naoki Sutter Shudo, the blade is exposed behind the petals, and the rose is partly made from a used cigarette filter. Although the blade acts as a literal thorn, consider the societal thorn in the Oscar Wilde story, The Birthday of the Infanta. The hotdog isn’t funny after “nothing is funny anymore.” Lord. High contrast heat vision makes the hotdog radioactive, a killer. Compassion fatigue for the sad sculpture. An option for survival: ten minutes a day, pulling up weeds in the garden. An option for viewing: ten minutes of rest before you look further. Husbands barely hang onto reality as they drown in an, either absurd or impressive, amount of alcohol. We continue laughing at and with their antics, until a sing-a-long goes awry. Then we cringe for the men, as they will not sit with disgust at all. Stop guys. Please. Husbands becomes sinister at the moment women enter the frame, those who bear the brunt of the trio’s pain. The husbands humiliate them all. Whether or not the real life Linda, Sandy Linter, loved the real life Gia, is much trickier. Interviews show her as colder, and Gia as much crazier. “Once her drug problem got out of hand, she funneled her anger into frightening macho behavior, jumping through a car windshield when she found a female lover with a male friend, and pulling a knife on anyone she thought had slighted her.” (NY TIMES, 1997) Heroin fueled dyke drama.